Anthony “Showtime” Pettis showed that he still has the ability to live up to his moniker. In the main event of UFC Fight Night in Nashville, Tennessee, Pettis scored a come-from-behind, highlight reel, Superman punch knockout over Stephen Thompson. 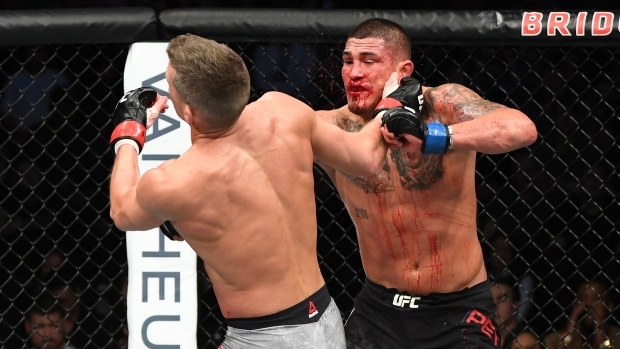 Thompson had bloodied up Pettis and was winning most of the striking exchanges throughout, but Pettis showed that he is always dangerous when he became the first person to finish Thompson inside the distance. In his post-fight interview, Pettis said that he should be considered a top-10 welterweight after the win, which is almost certainly going to be the case when next week’s rankings come out, as Thompson has been a perennial top-three fighter in the division. This was Pettis’ debut at welterweight and he became the third fighter to win as a featherweight, lightweight and welterweight, Kenny Florian and Conor McGregor being the others, according to ESPN Stats and Info. The win marked back-to-back weeks where fighters who had moved up from lightweight to welterweight won in main event spots, as Jorge Masvidal knocked out Darren Till last weekend. There were three Canadian fighters on the Fight Night card in Nashville and they fared well. The first Canadian on the card was Randa Markos, who scored her most dominant victory to date. Markos controlled her Ultimate Fighter housemate Angela Hill, taking her down, imposing her will and inevitably scoring a submission win via armbar. Markos has had an up-and-down UFC career, but she looked like she had finally put it all together in this victory, utilizing her wrestling to neutralize the mostly striking-based Hill. The second Canadian was 5th ranked women’s flyweight and former bantamweight title challenger Alexis Davis, who fell short in her matchup with Jennifer Maia. Maia had a marked advantage in the striking department and took advantage of that in the 1st and 3rd rounds, clawing her way to a unanimous decision victory with a score of 29-28 on all three judges’ cards. The final Canadian was John Makdessi, who landed leg kicks at will en route to a unanimous decision over Jesus Pinedo in a fight that drew a negative response from the crowd due to a perceived lack of action. There are no Canadian fighters scheduled to compete in the UFC until their May 4th Fight Night event in Ottawa. UFC Fight Night at Bridgestone Arena in Nashville, Tennessee drew 10,863 attendees for a gate of $939,095.99 (USD). Performance of the Night bonuses were awarded to Pettis and Markos for their spectacular finishes, while Bryce Mitchell and Bobby Moffett earned Fight of the Night bonuses for their back-and-forth bout that resulted in a unanimous decision win for Mitchell. Pettis, Markos, Mitchell and Moffett each earned an additional $50,000 USD. Despite being 37 years of age, former women’s bantamweight champion and the first fighter to defeat Ronda Rousey, Holly Holm is going to continue her career for the foreseeable future. According to ESPN’s Ariel Helwani, Holm has signed a new six-fight deal with the UFC. Holm was supposed to face Aspen Ladd at UFC 235, but that matchup dissolved for undisclosed reasons. Brazilian outlet Combate reported that Holm was in talks to face bantamweight champion Amanda Nunes at UFC 237, but that matchup never came to fruition. Holm has twice attempted to become the UFC’s women’s featherweight champion, but lost to Germaine de Randamie and Cris Cyborg in those opportunities. Holm is 5-4 overall in her UFC career and is ranked 2nd in the women’s bantamweight division. According to a report from Brazilian outlet Combate, former two-time featherweight champion Jose Aldo was hospitalized last week due to a bacterial infection. The report says that if Aldo’s condition doesn’t improve significantly in the next week that he may not be cleared by doctors to compete at UFC 237. Aldo is scheduled to face Alexander Volkanovski in a bout that could end up having very high stakes as the champion Max Holloway competes for the interim lightweight title at UFC 236 in April and has hinted that he may vacate the featherweight title if he is successful. Aldo has won two straight matchups by TKO after nearly five years of not having won inside the distance. His scheduled opponent Volkanovski has won 16 in a row, including all six of his UFC outings. To make matters worse for Volkanovski, he told Ariel Helwani that a good friend of his postponed the date of his wedding so that he could compete at UFC 237, which takes place on May 11 in Rio de Janeiro, Brazil.